Century Stair's innovative staircase designs are crafted with a legacy of quality and value. We have been working since 1976 with highly regarded home builders, architects, and homeowners in the Washington DC metro area. Our team of project managers, designers, installers and expert craftsmen have accumulated many years of experience creating, fabricating and installing furniture-grade masterpieces, reproducing historical and artistic staircases, and producing architectural stairs. Our climate controlled facilities (Haymarket, VA) combined with the latest technology and the artistic eye of our craftsmen, allow us to provide in a timely manner high-end stairs that match many aesthetic requirements, building codes, and budgetary guidelines. From Design to Implementation, Century Stair Company is the Washington, D.C. Area Luxury Stair Builder. We are the premier manufacturer of stairs & rails in Northern Virginia & the DC Metro. Since 1976 Century Stair Company has had a history of stability, growth, & commitment to customer service. Loudoun Stairs, Inc. was started in 1987 and has grown to not only an indoor stair and rail manufacturer, but also an outdoor railing manufacturer, commercial railing manufacturer as well as adding a renovations department. As a custom manufacturer we pride ourselves in our customer service and our ability to adapt and change with the times to suit the customers desires and needs. We strive to produce the highest quality with the fastest turn-around time while still maintaining high standards, integrity, and the use of a "measure twice, cut once" practice to ensure customer satisfaction. For over 20 years, we have been providing standard and custom craftsmanship in the design, fabrication and installation of stainless steel and alloy products to highest quality standards. Vintage Wood Floors and Stairs is a dedicated group of professionals, with over 20 years of experience in maintaining the highest standards in products, quality service and customer satisfaction in the market. We serve homeowners in Northern Virginia, as well as the Washington Metropolitan Area. As part of our business model, we look at everything from the customer's point of view. This means we work as carefully on your home, as we would our own. Before we finish a job, we make sure that you are completely satisfied. In addition, we do all of our own installation and finish, and never hire out to sub-contractors. Vintage Wood Floors and Stairs offers installation, sanding, restoration and refinishing of stairways. Your staircase is often the first thing that visitors see when entering your home. You can make a lasting impression by working with us to enhance the look and feel of your staircase. If you have an outdated style, we can assist you with choosing something that looks more modern. We always ensure that the style fits in well with the rest of your home decor. Our company offers a wide range of styles and installation options, including refinishing your existing banister and simply upgrading to new balusters. We guarantee you a well organized, clean, neat process and encourage you to look at the photos on our website to help you envision what your new staircase might look like upon completion. Founded in 1991 by visionary entrepreneur, John K. Gutierrez; the Studios is a tightknit team of designers and craftsmen whose passion is building. Building is in our blood, and we are excited about making anything from stools, tables, benches, lighting, staircases, signage, sculptures, and even trashcans. Our clients include architects, designers, builders, private individuals, universities, hospitals, churches, museums and public institutions. 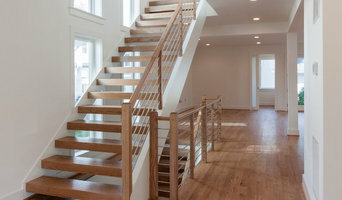 Custom carpentry specializing in stairs and rails built on site, not in a factory. 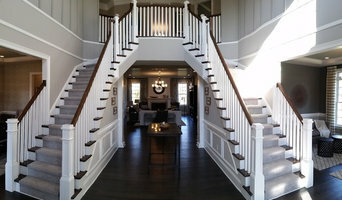 Custom interior stairs is our specialty. Our company provides service in Virginia, Washington D.C., and Maryland. We are one of the few companies left that stick builds quality stairs on your site not in a factory. We build curved stairs and straight stairs. We will overlay both boxed and open staircases with oak treads. We will replace iron rail with wood railing in older homes or install wood railing in new homes. 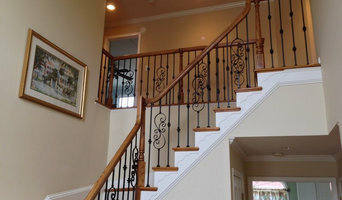 The new trend for balusters is iron, which can be installed in a variety of patterns and styles. If you prefer the more traditional, we offer a large selection of wood balusters, which can be painted white or stained. From Modern to Colonial we will build to suit. Custom craftsmanship and quality service is provided to all customers. Rails and balusters can be completed and stained or you can choose to do the staining. We love to help our customers transform their average stairs into a beautiful focal point of the home. Give us today at (540) 846-6472 for a free estimate today! Detailing, fabrication and installation of custom architectural and miscellaneous metal products including staircases, railings, gates, display fixtures, prototypes, ladders and light structural for residential and commercial contractors, roofing contractors, and modular building contractors. 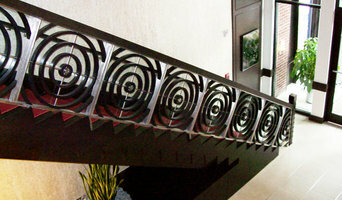 Metal fabricators, specializing in custom stairs, railings, doors, gates, canopies and furniture. Adam Curtis, the owner of Design-Weld is a professional sculptor as well, and is ready to assist clients with design services and direction. Mr. Curtis has worked in the building trades for more than thirty years. 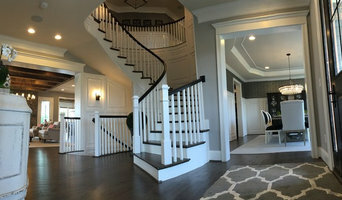 Family owned business since 1996, serving both home owners and building industry, we specialize in interior railings installation, including existing rail remolding, custom finishes on new parts and new construction. Choice Stairways is a classic stair and rail manufacture. Specializing in custom staircases, Choice Stairways has the technology and experienced employees to manufacture circular staircases, spiral staircases and curved staircases for residential, commercial and remodeling clients. We do everything involving metal fabrication and welding for your house. This could be a stairway railing or a full stairway, fences, gates, balconies, window guards or flower boxes. We do decorative work and also work for boats such as fishing rod holders. Whatever style you want we have done, from matching a historical look, to traditional to modern. We can also work with a range of different metals. Our lead fabricator has an art background that helps give the work a nice flair and finish.